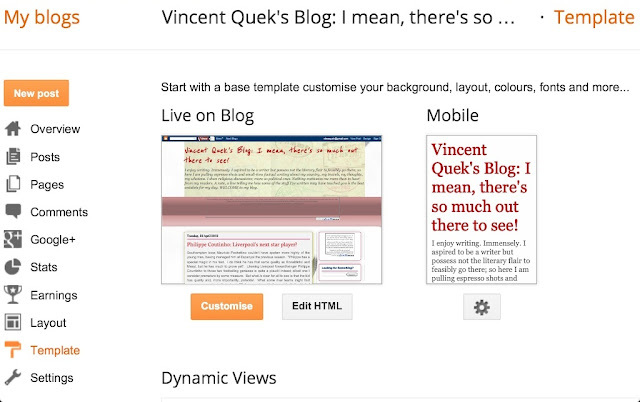 Apparently many bloggers using the Blogger platform have encountered the problem of not being able to apply changes to - and hence customise - their blog's template using Blogger's Template Designer (this I gathered through Google). I was one of them. Whether or not this had anything to do with Blogger upgrading to their new interface last Sept/Oct, I'm not entirely sure; but in my case at least, the timing seemed to coincide. Having said that and because I'm no techie, I really don't wanna jump to conclusions and point fingers at the good people at Google.... and neither should anybody. Anyway, the good news is I've figured out how to fix the problem and have since customised this blog the way I want it to appear; and here I wish to share with all how I did it. Now this post may seem longish, but that's only because of the diagrams I've incorporated for ease of reference; so bear with me. It's really quite simple. Step 1. IMPORTANT: You must first have your mobile template enabled (I really don't know why; I found out by trial and error that it's a pre-requisite). 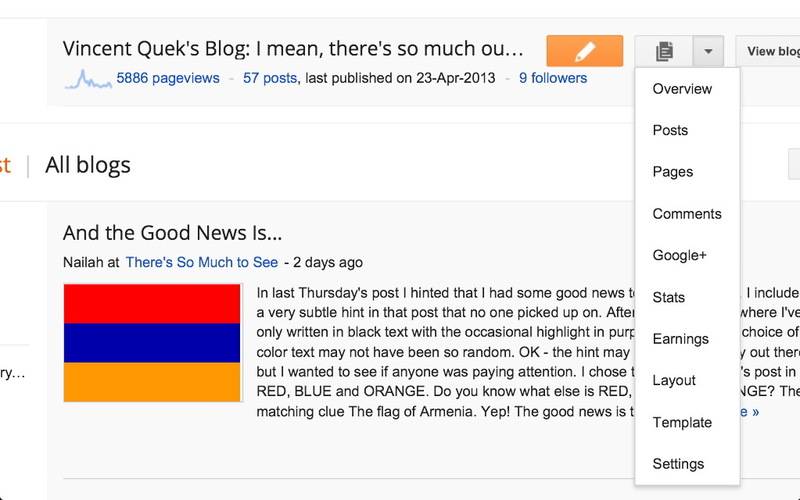 This is how you enable it (see Diagram 1): At your blog's dashboard, click on the arrow-down button located left of the "View Blog" button. Select "Template". Step 2. At your template screen (Diagram 2), click on the cogwheel under "Mobile". 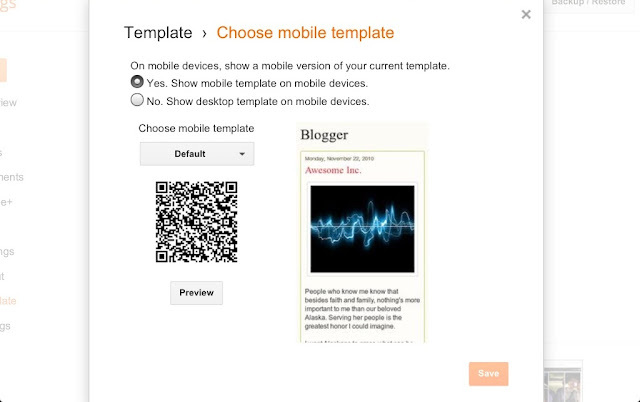 This will take you to the "Template > Choose mobile template" screen (Diagram 3). Step 3. At the "Template > Choose mobile template" screen, select "Yes. Show mobile template on mobile devices". Click "Save". Your screen will revert to the "Template" screen as in Diagram 2 above. Step 4. Next click on "Edit HTML". A screen as in Diagram 4 will appear. Here, click on "Revert widget templates to default" and save. You'll be taken back to the "Template" screen (Diagram 2). Step 5. 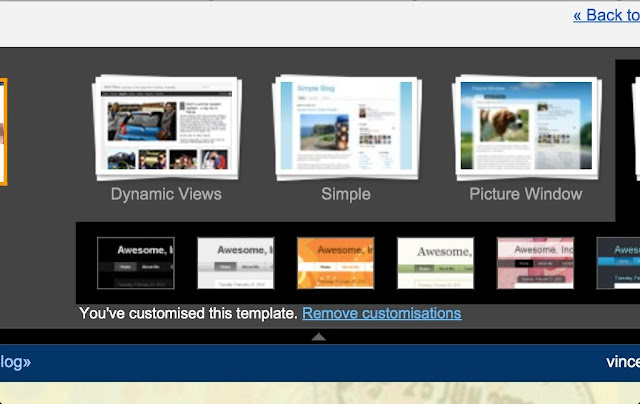 Next, at the "Template" screen, click on the orange "Customise" button. The "Blogger Template Designer" screen will appear (Diagram 5). Click on the blue "Remove customisations" link near the top of your screen - this removes ALL customisations that you've previously made. If all these steps are done correctly and in that sequence, your blog will have by now reverted to the default Blogger template (boring!). In short, you're on a clean slate. You may now proceed to choose your new preferred template and customise the look of your blog to your whim and fancy using the template designer - and this time, it ought to work. 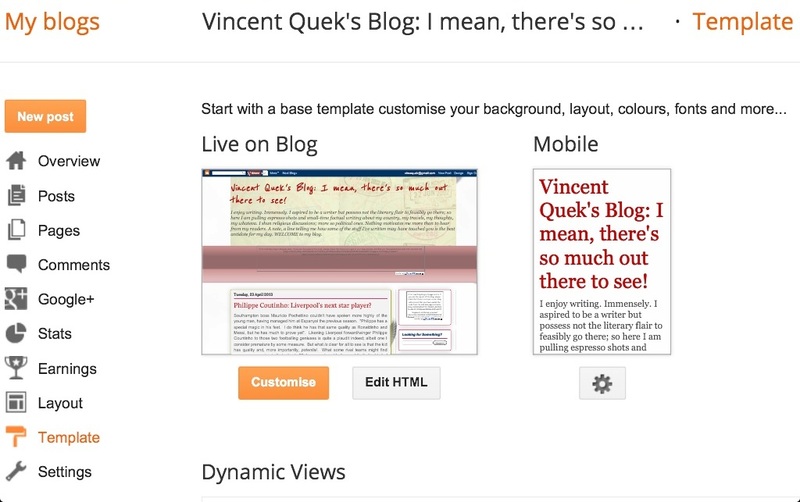 I suspect the problem of Blogger's template designer not showing or applying changes is due to the numerous customisations you've previously made to your blog template that may have resulted in some kind of "conflict" with the Blogger platform. In other words, you fiddled too much with them. This I believe causes the template designer to malfunction and become non-responsive. Note: This is notwithstanding the fact that some of you may have NOT imported any third party HTML scripts as part of your previous customisations. You'll find that merely switching templates doesn't solve the problem. I'm guessing this is because doing this in itself does not remove previous HTML customisations or reset gadgets. I've no doubt there are other ways of fixing this problem - but being a tech dummy, this is how I fixed the problem on my blog.... and it worked. Do try out the steps I mentioned if you're facing problems with your template designer and let me know (in the "Comments" field below) whether it works for you. If it does, well and good - but please tell me. If it doesn't, I'm afraid you may need to turn to the experts - please tell me too. Good luck. Waiting to hear from you guys. I followed all your steps...still doesn't work. Frustration is not even a word to describe me right now! Sorry to hear that, Denise. Did u set your mobile template to Enabled? omg it worked! i love you! Hi, Olivia. Thanks for dropping a line. So, is it okay now? I'm delighted to hear that, Georgia. And thanks for letting me know. Thanks for the help i already had nothing on my page so for me it helped to click the "no.show destock template on mobile devices"
Hello, Gabriela. Glad to be of help. I see you've only one post on your blog. New to the blogosphere? Tried your method and it stilldoes not work...any other suggestions? Did you ENABLE your mobile template first? So happy it worked for you, Andra. Thanks for letting me know. Hi, TPS. Bottom line; did it work eventually? You're the first blog I located in reference to this and it worked beautifully. The only thing I did differently was when you stated the 'revert widget to default " was I checkmarked just the blog section, went back to my time settings and saved- reloaded and voila. You're a lifesaver!Thanks you for sharing your experiences. Thank you so much for your feedback. I'm really glad it worked for you. Thank you so so so much! It worked for me and I can finally begin creating my blog! Thank you for letting me know, Bea. I could almost feel your joy there, which I find most encouraging as a blogger. Will follow you once your blog is up proper. am lookin for a way to add menu bar to the Awesome inc. mobile template. Hello, Sotonye. Just go to "Pages" from your dashboard and proceed from there. It's quite simple and pretty much self-explanatory. Good luck. It didn't work. :( It works on Internet Explorer but on Google Chrome it's not popping up. Hello, Caleah. I don't quite understand. If u're able to perform the changes on IE, then that's well and good. I did what you said and it worked only on the internet explorer..Better than nothing.Thank you :) Any idea why the apply to blog button still doesn't work on google chrome? )i enabled te mobile template in bothe of thebrowsrs..
i tried this but nothing happens once I click the save template button after reverting the tamplates to default. Hey I don't know if my problem applies, but I will explain it. So, for a week now after I disabled my mobile template, whenever I went to advanced editing on my blogger customize, I cannot change the color or font. I tried your steps, including enabling the mobile template and defaulting the templates, yet my blogger did not start fresh. I still cannot change the font or color of any words. Any suggestions? Thanks for the feedback, Sarah. Looks like you got the steps right there. Try doing it on Google Chrome instead of Internet Explorer. BUT FIRST clear your computer's cache. Do try and let me now. Thanks. Hi Vincent, I tried everything possible and it didn't work I am extremely disappointed, got any other ideas? Hi, Angelina. Try (1) clearing your cache, then (2) perform the steps on Google Chrome instead of IE or Firefox. Do let me know. Hi, it worked, so thank you!! But I really do not want my mobile enabled. is there anyway for me to now disable my mobile without the problem occuring again??? Hi, Dorothy. I'm so glad it worked for you. And thanks very much for your feedback. Yes, after having made the customisations you want, you may proceed to disable your mobile template. No worries there. and followed the steps, on the Revert widget templates to default page i selected all widgets & saved the template the continued with the steps. cleared the cache yesterday so don't know if that have had any effect. My pleasure, Rackel. Thank you. Hey..! thats a really good post. Even though in spite of doing all this, it dint work, but now i know what went wrong. I was trying to even find a reason as to why it dint work. Now i know, i fiddled a LOT with the template in the name of customization! :P Thanks! didn't work to my blog! help me! I've done at lot of custom editing on my blog, pin it button, hidden navigation bar, ect and these are elements that I really like. However I would also love to be able to edit my template again. If I reset all my custom edits, I can edit my blog, but obviously I will want to put them back again. If I do, will that just break it again? Hi Lydia. Before I reply proper, did u mean whether it'll break what u've reinstated? To fix the blog I must remove custom CSS. Once I've done this, the template editor will work and I can change my font colors and background and such. Then I will put back the custom code I cleared. Will my template editor become broken again? Hi, Lydia. I see what you mean now. I would have to say the answer is "No" simply because, in my case, the template editor continued to work just fine. It didn't work at first, but then I rolled up my sleeves and man-handled it. I ended up deciding to change some things about the layout and make it more simple. Thank you SO MUCH! I'm happy to hear that, Bube. Thank you for informing me. I have found another Very Simple Method as when I faced this problem. It was showing bX-b05.... something this error, Template Designer not opening at all. I waited for some time. -Clear all browser history and Cache. -Again Log in my account. And Surprisingly, It worked and working fine now. However, Your reason is correct as it happens as a result of numerous customizations. Hey thanks but I wanted a fix AND to keep my customizations, I dont want to revert my blog to the initial look. So I dare not follow your instructions. I have to many customizations to undo all that. Vincent, many, many thanks!!!! You have saved my bacon. I was beginning to think I'd have to go learn HTML from the ground up. Cheers!!! Pleasure's all mine, Gordon. Glad it worked for you. Just checked out your blog; love it. Have started following you. I hope you'll follow kind too. I am having problems uploading my own header image, does these steps help fix it? Thank you so much. This has been driving me crazy and your step-by-step instructions have been a great relief. I want to make just one small change. I don't want to lose everything I have already done and start over. Is there any other way without losing everything? Hello, Christen. Thank you for writing. I'm no tech expert, but do tell me what you'd like to amend. I'll see if I can help. It worked! SOOOO pleased! I thought I had to delete my blog just to make some simple adjustments! THANK YOU! I'm glad, Lucy. Thank u. Thank you so much! I've been trying to figure this out forever! I was even going to start completely over and just give up and move to wordpress. THANK YOU! THANK YOU! This was so helpful! My pleasure, Tora. Thanks for your feedback. Appreciated. Excellent, constructive feedback there, FAS. Thank you for letting me know; most appreciated. Hello good day like this? I am writing to see if I can help with a problem I have with a code to insert into blogger I am new to the codes and the system ..
Failed to load the preview of the template: Error parsing XML, line 53, column 3 "link" element type must be resolved by the end the match tag ""
What does that mean? What I have to do? Sorry, didn't work for me. I hadn't made any customizations. There's definitely a difference between the blog on the PC and on the mobile device, but the mobile is throwing up the posts in such a miniscule list. Not good for business! Clarify -- MY business, not yours! There is no blue button saying remove customization. Not working for me..
After then my html editor not working. Still i am finding to solve the problem. Thank you SO much!!! I was so frustrated then boom following all your steps worked! I wouldn't have thought removing everything would make it work but it did! Thanks again! It didn't work for me. I followed all steps including enabling mobile template. The strange thing is all but my most recent post show the customizations. My most recent post will not show the font I chose in blogger template settings or any posts that I try currently....? see my new template of my blog. Select which widgets to revert to their default values. Reverting a widget to its default value will remove any customizations you have made inside the tag. Thanks It Was Amazing Trick. I always tried With Html > head > body but it never worked. Guys you can trust this trick it really works. I generally do not see any problem with this, I can fully advise using this https://poweredtemplate.com/powerpoint-diagrams-charts/ppt-process-diagrams/01676/0/index.html site to download templates suitable for you. I hope that it will be useful for you, good luck! Fantastic post. Lucky for me I bumped into your site and it solved my problem. Very clear and precise! It worked for me. Thanks. Lot of thanks for your tips. Excellent web page design blog and you post looking nice amid this blog .